1. Select battery from the chart below. 2. Click on the Battery Model in Blue to proceed to price, options & checkout. § Add for Residential & Lift Gate Delivery, or if GB is required to provide a 2nd forklift installation. § Canadian customers – Prices are in USD. Additional delivery costs will apply. § Pricing is subject to change with the cost of lead. US Copyright Office #1-3049808855. Do not copy or reproduce without the express written consent of GB Battery. Check out using PayPal and most major Credit Cards. © Copyright GB Forklift Battery USA February 14, 2019. All rights reserved. 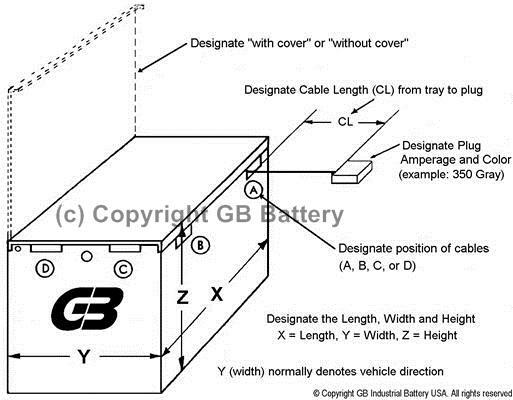 All images on this website are the exclusive intellectual property of GB Industrial Battery. 26L x 7 3/4W x 23 1/4H, with a removable / reversible covers. 26L x 6 1/2W x 23 1/4H, with a removable / reversible covers. 38 1/8L x 22 5/16W x 22 5/8H. 35 7/8L x 25 5/8W x 22 5/8H. 35L x 25 1/2W x 22 5/8H. 38 1/8L x 20 1/16W x 25 5/8H. Fits: Yale ERP030, Hyster J30 and Drexel SLT30 & SLT35. 38 1/8L x 24 5/8W x 25 5/8H. Fits: Yale ERP035 and ERP040. Hyster J35 and J40. 38 1/16L x 15 3/8W x 31H, with cover. Too tall for most applications. 31.56L x 17.95W x 23.25H (no cover). 38 1/8L x 23 5/8W x 22 5/8H (no cover) or 23 1/4H. 35L x 25 1/2W x 22 5/8H (no cover) or 23 1/4H. 38 1/8L x 26 7/8W x 22 5/8H (no cover) or 23 1/4H (with cover). 38 1/8L x 29 1/2W x 22 5/8H, no cover. 23 58H with cover. 41.75"L x 38.25"W x 23.27"H, no cover.